Thick durable heavy duty felt furniture pads with peel and stick backing in sizes ranging from .875 inch to 1.75 inch diameter for use on chair legs and other furniture and equipment. 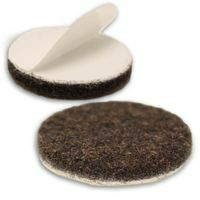 Expanded felt furniture pads are thick commercial grade dark brown chair leg pads that stay firmly in place and withstand ongoing use to protect hard surface floors, such as luxury vinyl and wood floors, from furniture scuffs, scratches and rust stains. 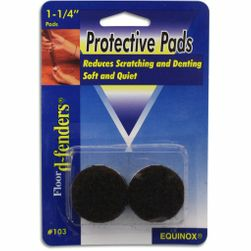 Buy flat, round felt chair leg pads in packages of 4, 8, 100 or 1000. Use at home or business. Quantities vary by felt pad size. For recommended use, application instructions, how to maintain your Expanded heavy duty felt glides, continue to bottom of page, below items. This item ships free via standard shipping method. 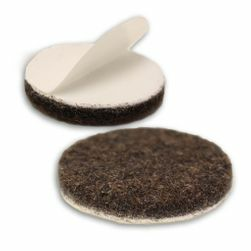 The round, thick Expanded felt pads glide easily on a wood, vinyl or other hard surface floors without scratching the floor. The adhesive on the back side of the pad is strong to hold secure to the bottom of the furniture leg while the commercial grade felt provides a soft, durable surface to move on the floor. The smooth felt pads are the right material for use as chair glides on hardwood, vinyl -sheet, luxury lvt, vct, rubber, linoleum and any other resilient types of flooring to minimize scratches and scuffing caused by furniture movement. 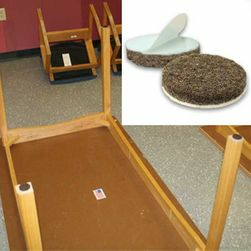 For the best performance, the round, flat felt pad should be the same size or smaller in diameter than the chair leg. Using Expanded Heavy Duty Felt Furniture Floor Protector Pads on chair legs does an excellent job of protecting the floor from scratches caused by repetitive furniture movement. Application: For easiest application of Expanded round flat felt furniture protective pads, turn chair upside down onto a table. Prepare wood chair legs by smoothing the bottom surface with sandpaper then wiping the surface clean with a cloth. For preparing chairs with metal or plastic legs, clean the bottom chair leg surface with isopropyl alcohol and wipe dry. Peel the paper off the adhesive side of the felt pad and press the felt chair leg pad into place on chair leg. Do the same for each chair leg or evenly distribute the felt pads on a flat based item. 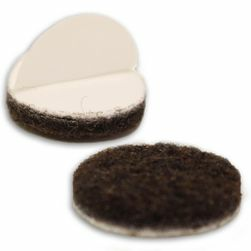 Maintenance: Felt pads should be wiped cleaned with a microfiber cloth and brushed with a wire bristle brush -or- vacuumed with a vacuum cleaner attachment to periodically to remove dust and small bits of dirt buildup. Place each chair on it's back or upside down to most easily access the felt pads. 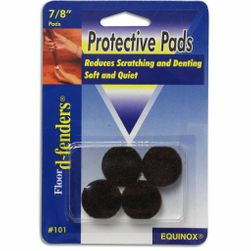 Replacement: Replace felt pads when they become worn. The amount of time pads can be used before needing replacement will vary depending on how much use, how dirty the floor gets, and frequency of floor cleaning and felt pad maintenance. To replace Expanded felt pads, peel the existing pad off of each chair leg. Use a scraper if needed to start lifting the pad off of the chair leg. Then follow the application procedure to apply new felt floor protector pads. Turning the chair upside down on a table top before starting will make the job easier. Packages of this peel and stick felt chair leg protector are available at 1877FloorGuy in quantities of 4, 8, 100 and 1000. Sizes range from 7/8-inch to 1-3/4-inch diameter. Free shipping available on Expanded flat round felt pads when ordered alone or with other floor care products.